In the past, two aqueducts took water up to the city entrance and into Roman Barcino from the Rivers Llobregat and Besos. Just behind the Plaça de la Catedral, in C/ Sagistrans, part of one of the old aqueducts can be traced in the walls of another building. Strangely, new brick work was built round the aqueduct, leaving its ghostly outline as a reminder of the Barcelona’s Roman heritage. 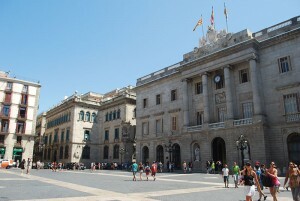 The inhabitants of Barcino were Barcinonensis and the centre of the city was the forum, a space for commerce and meetings. The Roman forum in Barcelona was located in Plaça Sant Jaume where the council and local government buildings are still positioned today. There is a side road leading from the square called Carrer Paradís, which wanders up past Ryans Irish Pub. Although this street appears to be an insignificant alley way, a little sign that states in even smaller letters “To Roman Ruins” craftily points towards towards number 10, Carrer Paradis, to what seems to be a private block of flats. Most definitely do not be shy as, on turning right into this area, four enormously magnificent Roman columns veer skywards, within touching distance. These columns formed a part of the original Augustine temple government building, inhabited by Roman Emperor Augustus himself for a short time. This place used to mark the highest ground level point in Barcino. These columns now stand as a reminder of the ancient city’s structure, upon whose foundations Barcelona as we know it has been constructed. Turning right out of Plaça Sant Jaume and into Carrer Ferran, the side street of Avinyó bends to the left. Kebab bars and traditional Catalan restaurants whet appetites with their wafting food scents. Look further though, and it is possible to see a number of bars on the left hand side of this road that house sections of the ancient city wall, still intact. 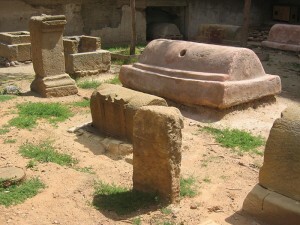 An ancient Roman burial site complete with tombs, not to mention the sunbathing stray cats, sits on a subterranean level in Plaça Madrid, located between the Ramblas and Portal del Angel. Most of the ancient city is now buried deep underneath today’s city center. Excavation work is constantly going on to uncover more of Roman Barcino but what has been dug up can be viewed in the City History Museum, located in Plaça del Rei, near Plaça Sant. Jaume. A lift goes down into the vaults of the city while a digital year display counts down time in big red flashing numbers. The doors open at 600AD and Roman Barcino breathes in the shadowy subterranean light. Extensive sections of the Roman wall, in addition to the foundations of buildings, churches and bathing areas can be seen. It is possible to stroll along the ruins of an entire street complete with a drainage system, trading areas and their corresponding preparation zones for salted fish, wine making, laundry and fabric dying. There is also a large exhibition of artefacts that were found during excavation such as jewellery, coins, ceramics and needles. It seems that women in Roman times were as prone to pluck their eyebrows as they are today judging from the large collection of Roman tweezers that are also on display. A short film shows a graphic representation of Barcino’s approximate dimensions and main structures, and its geographical location in relation to the rivers and the sea. Most excitingly, though, is the awareness that Barcino is slowly but surely growing as new archaeological projects uncover more ruins. Try peeping round the makeshift walls that cover over the excavation work! 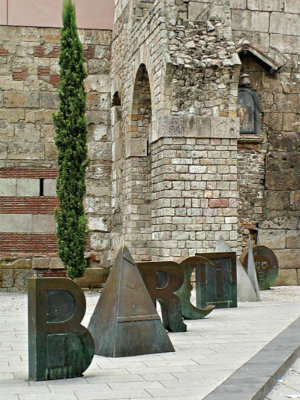 The best way to discover Roman Barcelona is to go for a wander in the Gothic district, and look out for the plaques that provide more information about the historic remains that you’ll find interspersed between the shop and bars of contemporary Barcelona. 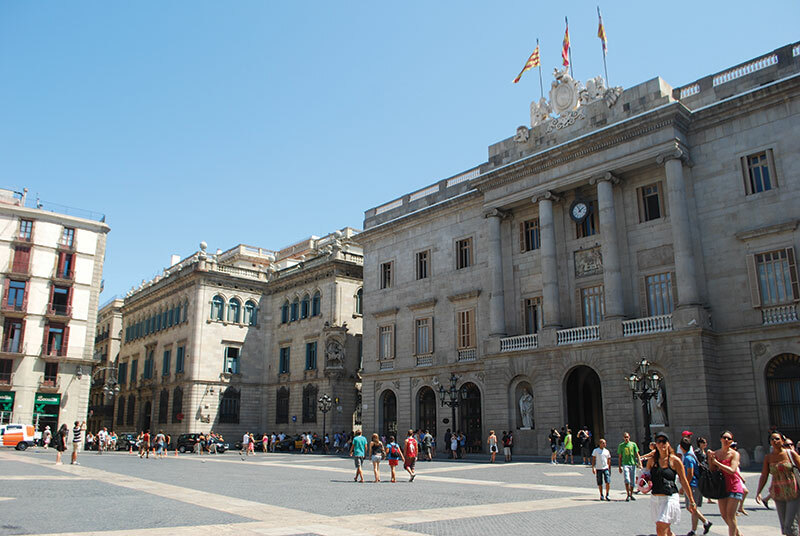 This entry was posted in Home, Neighborhoods and tagged ​​barcelona history, ​​barcelona tourism, gotic district barcelona, roman heritage barcelona, Roman ruins barcelona, visit barcelona. Bookmark the permalink.